Prof. Dr. Zainal Salam is a Professor in Power Electronics and Renewable Energy at the Centre of Electrical Energy Systems, Faculty of Electrical Engineering. He also serves as a research fellow for the Center for Electrical Energy Systems, Institute of Future Energy. His main research interests include all the areas of power electronics applications in renewable energy systems. To date, he is involved in over 30 projects and consulting works on power converters, solar energy and machine control. In 2005, Prof Zainal was awarded a grant by the United Nations Development Program (UNDP) to set-up and operate the Inverter Quality Control Center (IQCC). The IQCC laboratory is tasked to test the solar photovoltaic (PV) inverter connected to the local electricity grid. While in IQCC, he also contributed in developing numerous Malaysian Standards related to solar industries. On the international scene, Prof Zainal represents the country as the expert for the International Energy Agency (IEA) Photovoltaic Power Systems Task 13 Working Group, which focus on the reliability and performance of PV systems. Prof. Zainal was the Dean of Research for Energy Research Alliance—overseeing and managing energy related research work in the University. He is very active in research and publications; he has authored and co-authored over 200 papers in various technical journals and conference proceedings. He is among the most cited author in UTM, with over 3500 citations and a Scopus h-index of 27. In 2006, he received the prestigious Malaysia Rising Star Award (2016) as the highest cited author in the nation for frontier research. Since 2011, he has been the Editor of IEEE TRANSACTION ON SUSTAINABLE ENERGY and a member of Editorial Board for the Scientific World Journal (Hindawi Publishing Corp). 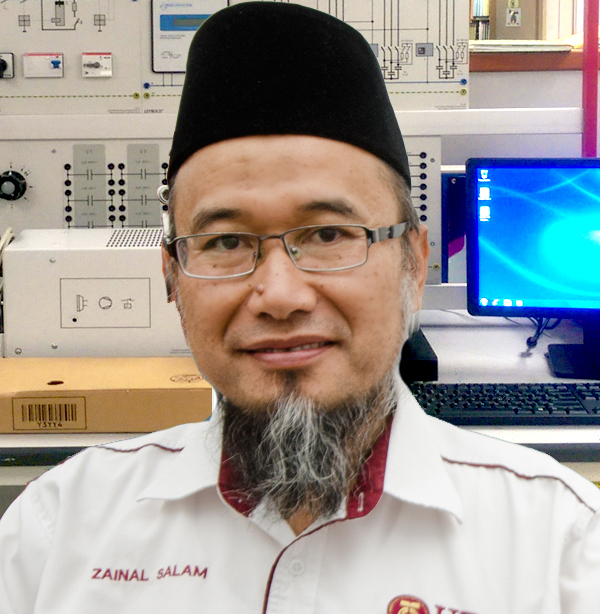 On the professional activities, Prof. Zainal has served as the Vice-Chair IEEE Power Electronics, Industrial Electronics and Industry Application Joint Chapter, Malaysia Section (2011-2013, 2016). He was the General Chair for four IEEE conferences, and has been invited as a keynote speaker in many conferences around the world. His hobby is to visit and explore new places, while learning the local culture of the places he visits.